“Sommerfrische” – outdated for “summer retreat” – when people left the cities during the summertime to escape the heat and find some relaxation in cooler areas. Even so terms like Sommerfrische or Landpartie (something like a picnic or little trip) aren´t that used anymore (except by me and maybe some city marketing), they were absolutely common in the 19th century. The Grimm dictionary defines it as “relaxed country stay of citizens during the summertime” and “love for the countryside of citizens during summer”. Having different residencies for summer and winter goes back thousands of years. During the Renaissance when cities started to flourish the aristocracy established having summer- und winterpalaces. During the 18th century the upper middle classes also adopted that custom. In the 19th century the railways made it easier and faster to travel and everyone who had the luxury of free time (and the funds) had a “Sommersitz” (a summer residence). If you couldn´t afford to have your own private villa for the summer, you just rented or stayed at inns and hotels. It was the start of something we call “tourism” today. 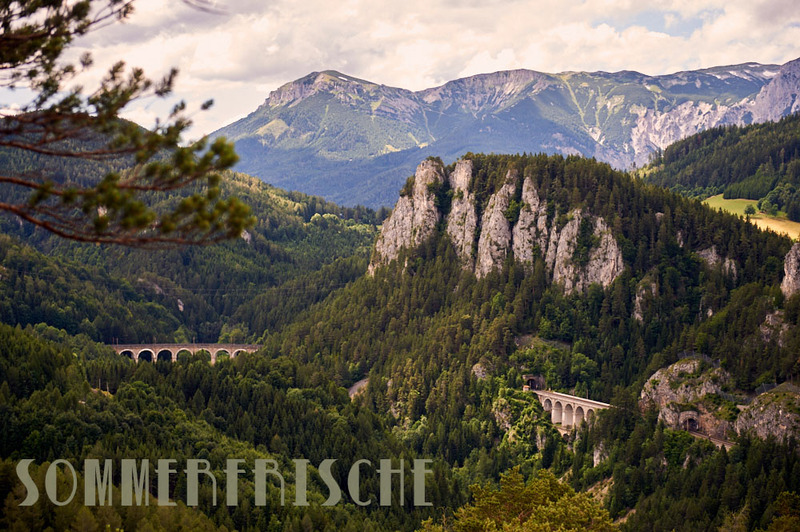 Loved places for Sommerfrische around 1900 were Salzkammergut, the area around Semmering and Rax, Wienerwald and Kamptal and later on bathes like Bad Gastein, bad Fusch and the thermalregion in Styria. I was at Semmering yesterday and on this photo you see the “20 Schilling Blick” – on the backside of the old 20 Schillingnote you could find this view.